Long Guns: There are no federal laws preventing unlicensed person from selling, delivering or otherwise transferring a long gun or long gun ammunition to a person of any age. Handguns: Under federal law, unlicensed person may not sell, deliver or otherwise transfer a handgun or handgun ammunition to any person the transferor knows or has reasonable cause to believe is under the age of 21. 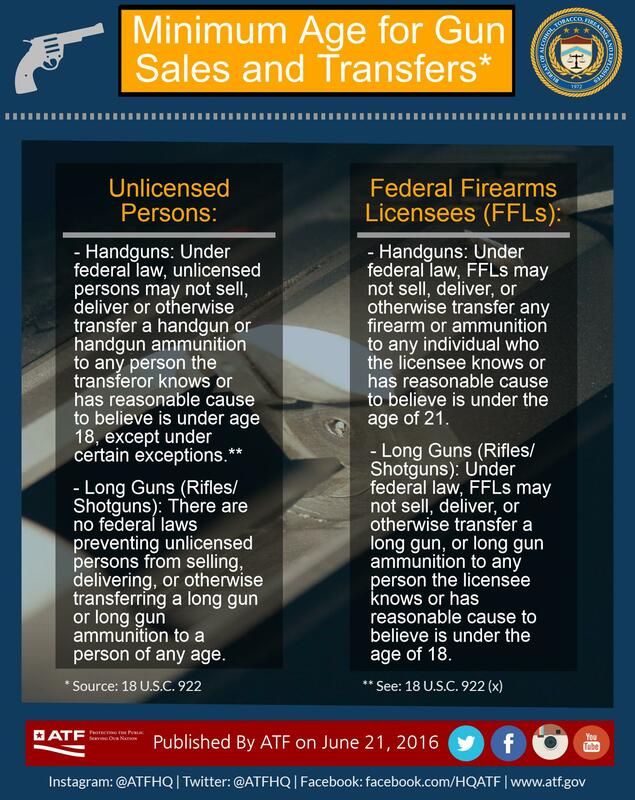 Long Guns: Under federal law, unlicensed person may not sell, deliver or otherwise transfer a long gun or long gun ammunition to any person the transferor knows or has reasonable cause to believe is under the age of 18.